This blog is the first in a series of articles intended to provide information about softwood lumber, including grade-marking, design properties, testing, and continued monitoring of the lumber resource. Lumber mills produce various sizes and grades of lumber suitable for structural use from a variety of tree species grown in the US and Canada. The lumber mill is responsible for having trained lumber graders and/or accepted lumber grading machines that can sort the lumber into various grades. To be able to mark the lumber with a building code approved grade-mark, the lumber mills subscribe to the services of a grade-marking agency. Each agency that provides grade-marking services to lumber mills must be certified by the American Lumber Standards Committee (ALSC). Some agencies are “rules-writing” agencies in addition to providing grade-marking services. 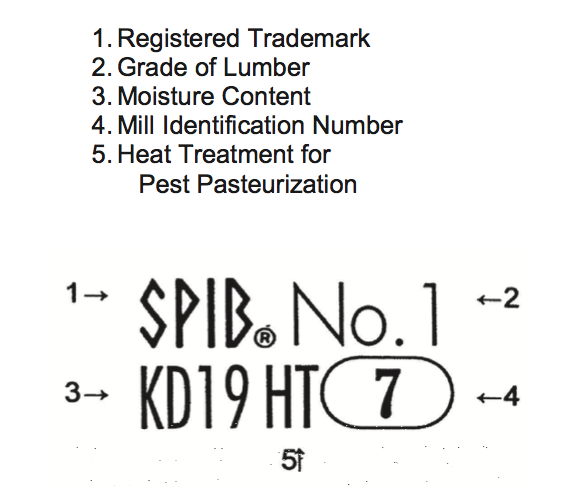 While any grade-marking agency may provide grade-marks for any species of lumber, only one agency is responsible for approving and publishing the grading rules for a particular species or species group of lumber. The Southern Pine Inspection Bureau is the rules-writing agency for southern pine, mixed southern pine, spruce pine, sand pine, and bald cypress. Each piece of lumber is inspected by a qualified mill grader. The grade-marking agency provides a systematic check on samples of the lumber that is produced by a mill. The frequency of sampling by the agency varies based on the production of the mill. If inspected samples are not found to meet the requirements of the grade, the affected lumber is held by the mill until it can be corrected. Grade-marking agencies such as SPIB can also provide valuable assistance to subscriber mills in evaluating and improving mill operations such as mill surveys, evaluations of planer and/or kiln operations, etc. All grade-marking agencies have an additional level of quality control provided by the American Lumber Standard Committee, which has inspectors who visit lumber mills and provide oversight to the grade-marking agencies. These three levels of inspection (mill, agency, and ALSC) help customers and designers be assured that grade-marked lumber is suitable for its end-use application. The next time you are in a building supply store, walk through the lumber section and take a look at the grade-marks on the lumber!